The 68th FIFA Congress has selected the United Bid of Canada, Mexico, and the United States to host the 2026 FIFA World Cup. The Greater Boston Convention & Visitors Bureau (GBCVB) partnered with the Kraft Group, the Mayor’s Office of Tourism, Sports & Entertainment, and the Massachusetts Office of Travel & Tourism to showcase Boston and Massachusetts as a premier global destination, and a deserving host for World Cup games in 2026. “I want to especially thank Robert Kraft, owner of the New England Revolution and New England Patriots, for his dedication to the United Bid, especially at the national level, as honorary chair of the bid committee,” said GBCVB President & CEO Pat Moscaritolo. The United Bid was compelling for its unmatched infrastructural capacity: 23 operational stadiums, 150 premium training facilities, and millions of hotel rooms. While 23 cities are finalists in the United Bid, only 10 US cities will ultimately be selected by June of 2020 to host games in 2026. The economic impact of the 2026 tournament will be unprecedented given the expansion of the field from 32 team to 48 teams. With nearly 6 million spectators expected at 80 matches, the tournament is expected to generate more than $14 billion in revenue. 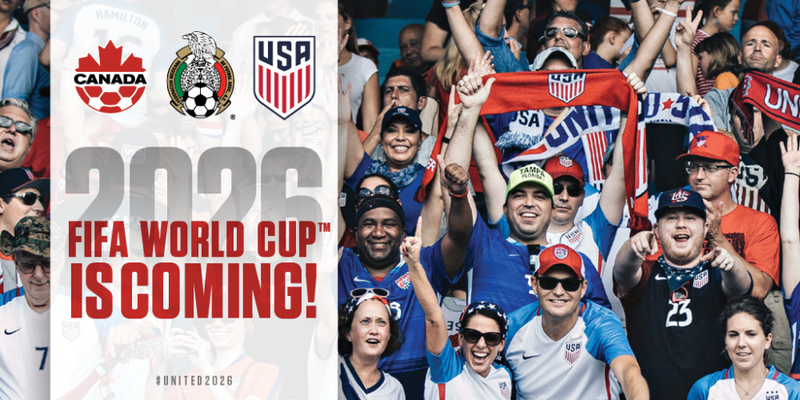 Moscaritolo credits the 1994 World Cup tournament, which included Boston and Foxboro as a host venue, as a turning point in Boston’s emergence as a world-class destination for major international events. Overseas visitation to Boston grew by 50% in the five years following the 1994 World Cup. “Our visitor industry’s efforts now pivot to working with the Kraft Group and the United Bid Committee to convince FIFA to select Boston as one of the ten Host Cities for 2026,” said Moscaritolo. “With Boston and Logan Airport’s emergence as a global transportation complex serving non-stop 60 international destinations, with Gillette Stadium a state of the art facility that has hosted major international events, and with more than 7,000 new hotel rooms added to our supply since 1994 when we last hosted World Cup games, we have a compelling case to make to FIFA,” Moscaritolo added.